Alaskan Sockeye Salmon is arguably the best salmon in the world. Some would say it’s the best fish in the world. Its intense color, beautiful texture, high oil content, and rich but subtle flavor make it a favorite among seafood enthusiasts. Because of the high oil content, it takes smoke exceptionally well, so smoked sockeye brings a premium in the retail market. Sure, King/Chinook and Silver/Coho salmon are better known and much more widely distributed. King is popular primarily because the fish are large and exciting for sport anglers to catch. King is noticeably fattier with more marbling than other species. Plus, it’s got the best marketing name. Coho is in a sweet spot of popularity, quality, and sportsman appeal. But ask most Alaskans what salmon they prefer, and you’ll often get “sockeye” as the answer. A decent amount of Alaskan sockeye makes its way into the high-end retail market in the “lower 48”. It’s treated as a delicacy in finer restaurants, and we often see sockeye fillets in good fish markets in Portland bringing prices as high as $35/lb. 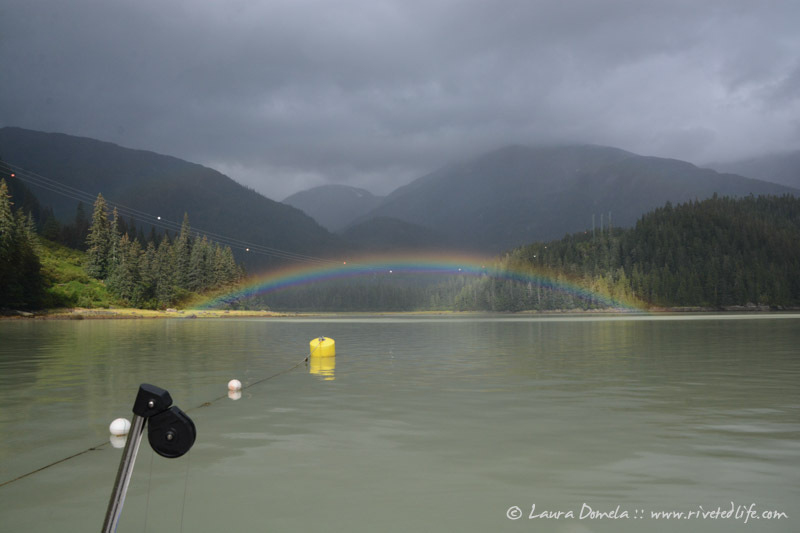 Kinda makes you want to head up to Alaska, grab a pole, and catch yourself some sockeye, doesn’t it? Well, not so fast there Ishmael. Sockeye have small mouths and feed on very small prey. They pretty much never strike at lures or flies, and really can’t reliably be caught with a rod and reel – unless you just happen to snag one, or your hoochie randomly cruises by a rogue sockeye with an attitude problem. 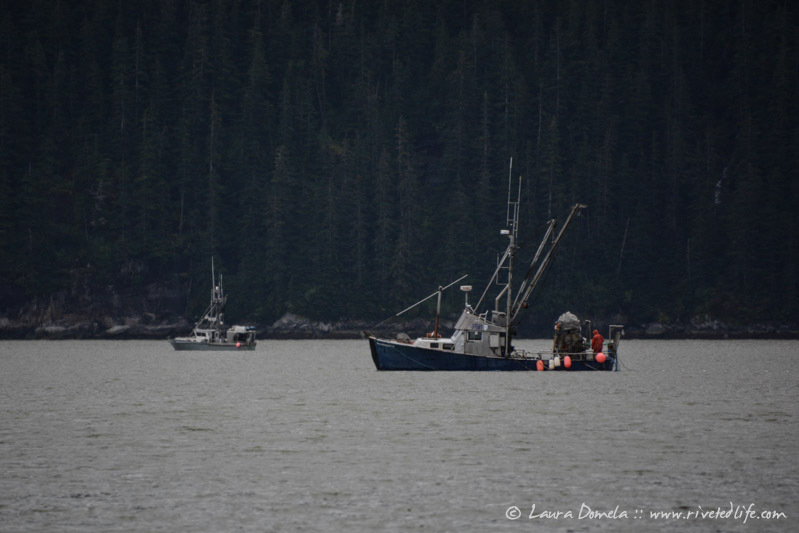 The sockeye we get to eat are primarily caught through gill netting by commercial fishermen. 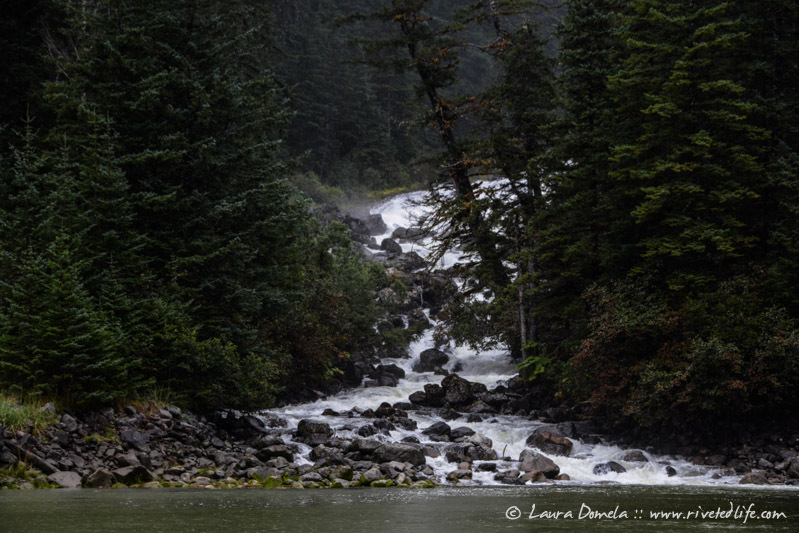 Over the past several decades, pollution, over fishing, disease and other factors have dramatically reduced the populations of all types of salmon, and particularly sockeye. With worldwide demand for the product constantly increasing, fish farming has emerged as a dubious practice for creating large amounts of fish meat quickly, but with serious consequences in terms of fish quality and environmental impact. 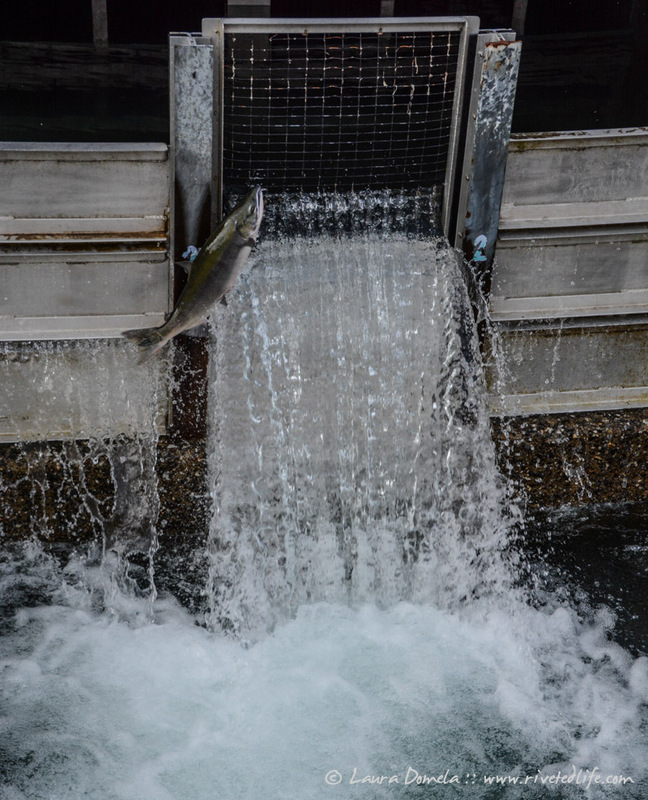 Fish farms, along with the antibiotics, chemicals, and other factors that come along with them, are known sources of disease, pollution, and non-native species introduction that cause serious damage to native salmon populations. Plus, fish farming dumps large quantities of inferior-grade product on the worldwide market, dramatically impacting the price of wild salmon, with dire consequences for the Alaskan fishing industry. Don’t confuse hatcheries with fish farms. 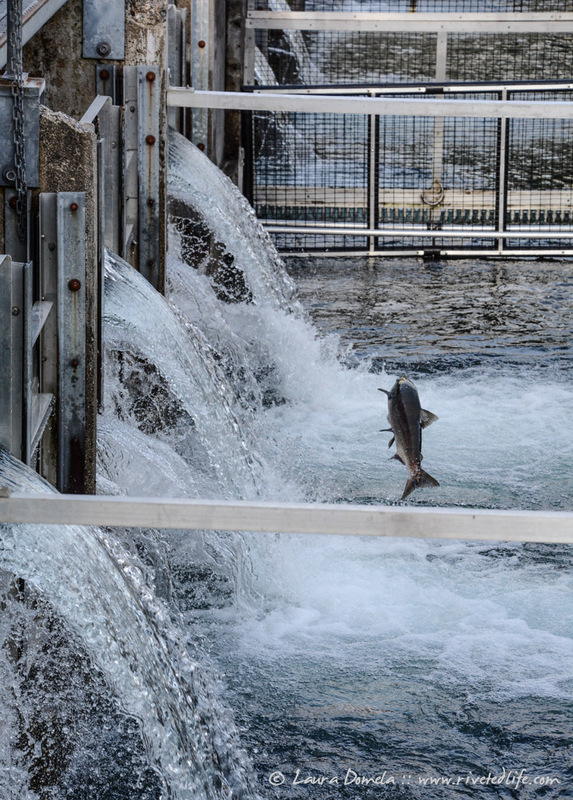 Hatcheries are one of the best weapons we have in the quest to preserve and propagate native salmon species, preserve fish quality and the environment, and sustain the commercial fishing industry. The idea is simple – restore the native fish populations and offset some of the manmade damage to the natural habitat and spawning grounds by helping the returning fish breed, protecting and nurturing the fry until they’re ready, and then releasing them back into the wild where they can live normal, happy salmon lives until they’re ready to return, spawn, and die. Sockeye are special, though. Just as they aren’t easy to catch, they are also very tricky to breed. Most other species of salmon can be hatched, held briefly until they begin to grow, and then released into the wild within a few weeks. Sockeye have to be held and nursed for almost two full seasons before they can be released into the wild and survive. 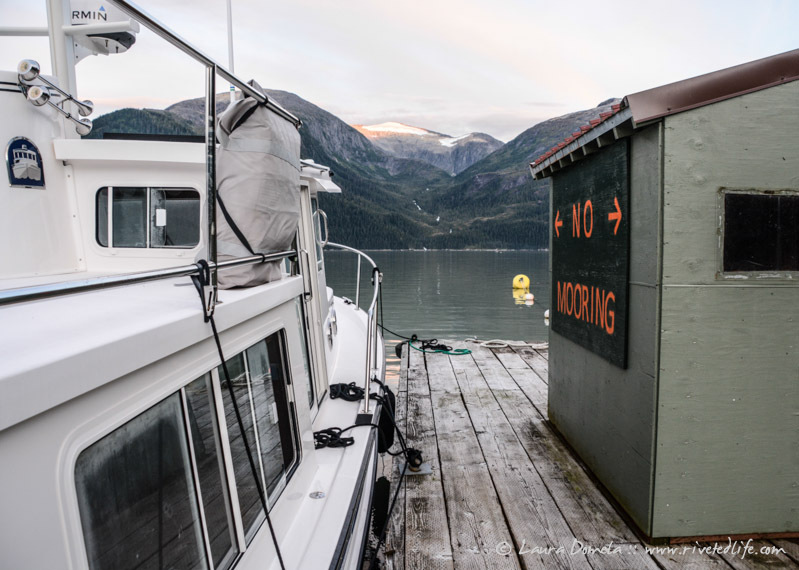 That means a hatchery for sockeye has to be equipped to raise and care for fry/smolt for almost two years before they can discharge them – requiring significant additional amounts of labor and expense. Snettisham Sockeye Hatchery sits at the head of Port Snettisham near the Speel river, about ten miles in from the entrance off Stephens Passage. 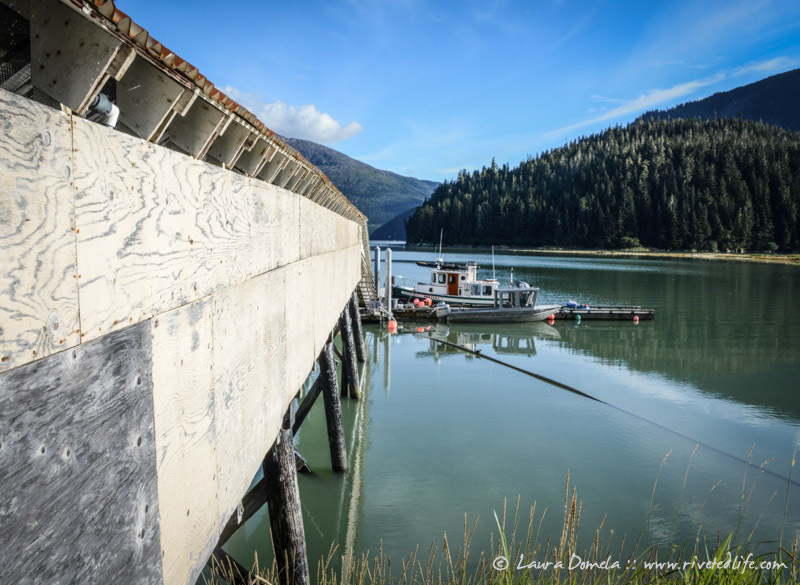 It is adjacent to the Snettisham Hydroelectric Project, an electric generating facility that provides most of the electricity for Juneau, which is about 30 miles to the north. A small crew of around a dozen people operates the hatchery, with temporary seasonal staff that come in to help out in the busiest times. Snettisham is accessible only by boat or float plane, and there are no stores or other amenities. 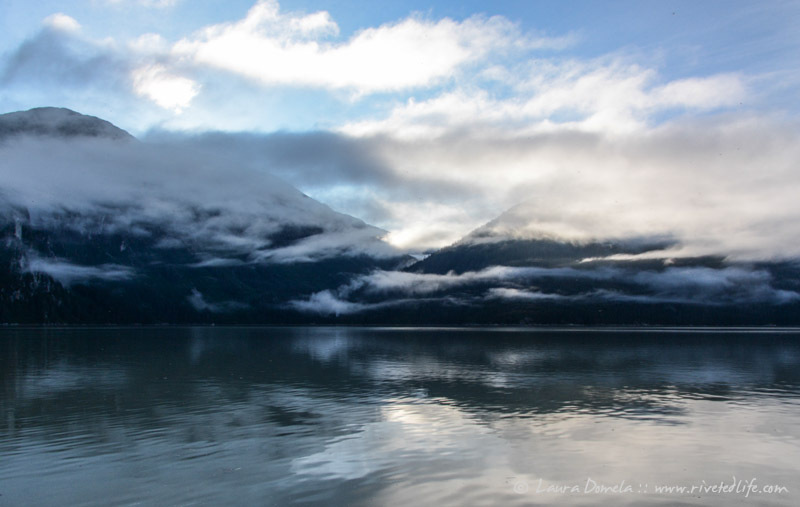 The nearest market is in Juneau, which is a several-hour boat trip (or a brief but expensive float plane trip) away. Two weekly mail flights comprise most of the in-person contact with the outside world. The Snettisham staff is pretty excited that, due to their proximity to the power plant, they have a decent land line, a modest internet connection, power, and fresh water, 6 miles of road -– luxuries that many remotely-located hatcheries do not enjoy. Kevin and Darcy, the couple who manages the hatchery, have a Nordic Tug, read our blog, and when they found out we were in SE Alaska, they invited us to come by for a tour. Sweet! We were pretty excited to meet the staff, tour the facility, and explore the surrounding environment. About 30 minutes after we entered Snettisham inlet, we encountered probably 30-40 gill net boats, stretching their nets across the channel in every direction. One fishing boat came out to meet us. The captain explained that most of the boats were setting their nets from the edge to near the center, so we could probably head down the middle of the channel swerving between the bright orange buoys and be clear of most of the nets. We slowed and watched carefully as we weaved Airship through the slalom course of gill nets for the next several miles. As we rounded the last corner, we heard the voice of Kevin Steck – the manager of Snettisham Hatchery – on the VHF. He told us to come on into the harbor and tie up at the float (the one with the big “No Mooring” sign), and he’d come out and meet us in his skiff. Kevin is noticeably excited. We have apparently arrived on a Red Letter Day at the hatchery. The fishing boats we saw on our way in will probably not be there tomorrow. There is an elaborate game of counting and allocating at play. The number of returning fish for various streams is counted and estimated, the amount of breeding stock required is calculated, and a decision must be made about whether or not to allow commercial fishing boats to rush in and harvest any surplus. Kevin was up late last night re-doing estimates and coordinating with the various organizations who regulate commercial fishing. It is critical that enough salmon be allowed into the natural streams to spawn and into the hatchery to establish breeding stock. Without those essential fish getting through, there will not be enough to breed the next generation. But, if too many fish come through, they are wasted and the fishermen miss out on their opportunity to harvest. 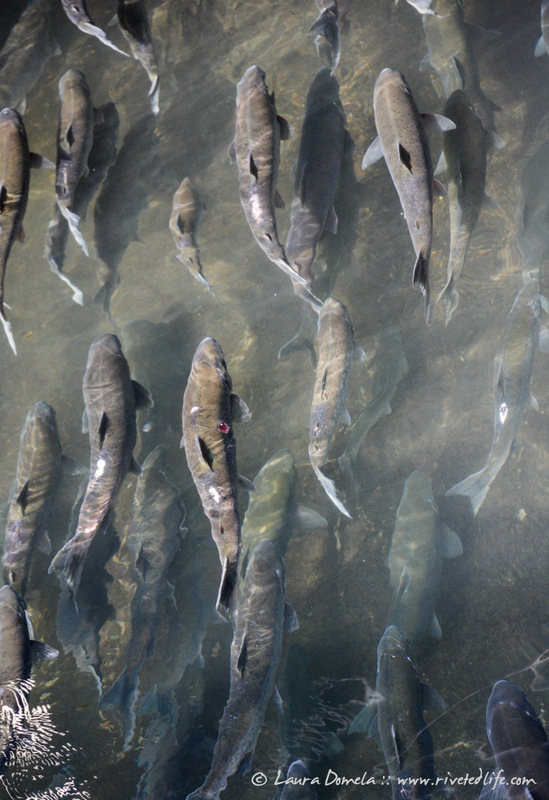 The hatchery is owned by a non-profit company (DIPAC — Douglas Island Pink and Chum) that serves the fishing industry, so its whole reason for existing is to be sure that adequate populations of fish return every year to provide a sustainable sockeye harvest for the commercial gill netters. Today, they finally (just barely) made the minimum return allocation. The authorities gave the green light, and dozens of fishing boats descended on Snettisham. Those were the boats and nets we picked our way through on the way into the harbor. Tomorrow, the fishery will probably close again and the boats will be gone. The window is extremely narrow. 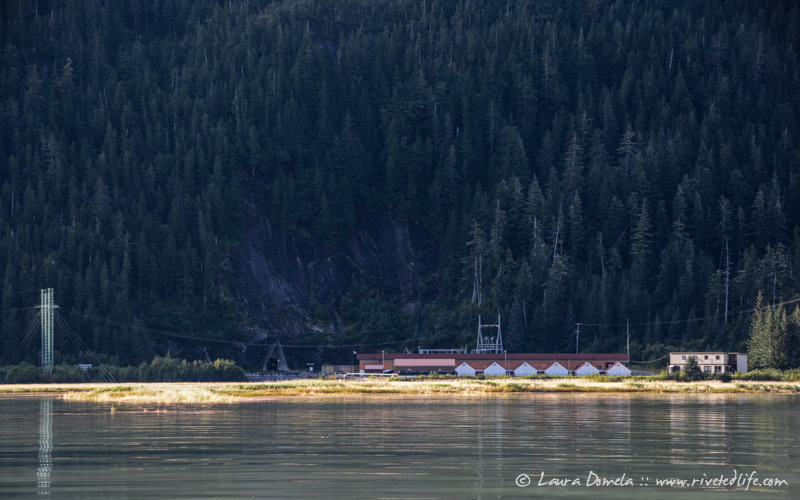 We arrive at the dock and jump into a pickup, winding up the dirt and gravel road to the hatchery. Standing outside the entrance, Kevin introduces us to Darcy (his wife), Assistant Hatchery Manager and a marine biologist. They begin to explain how the whole thing works. Beside where they stand in their Xtratuf boots, we notice a foot wash. 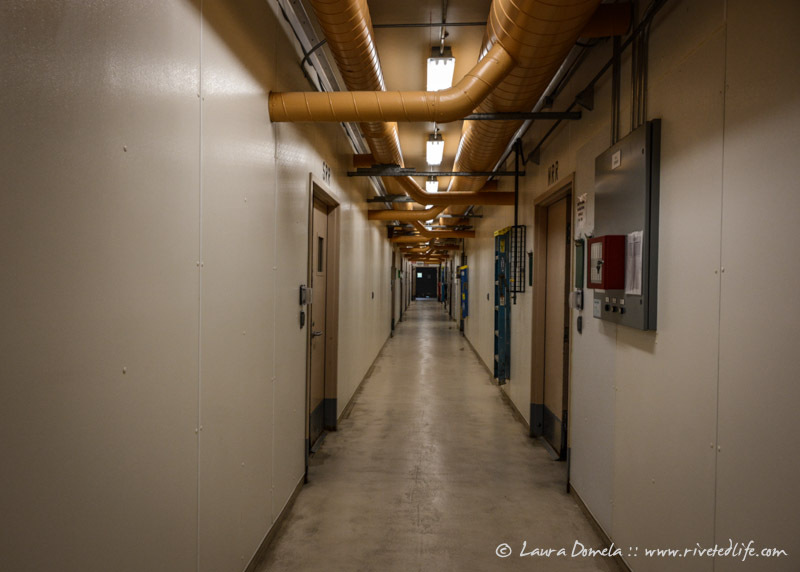 Very quickly, it becomes clear that every activity in the hatchery operates under constant maximum security alert level. The enemy is always out there, silent, invisible, waiting patiently for the tiniest misstep that will allow it to break in and destroy the entire year’s harvest. 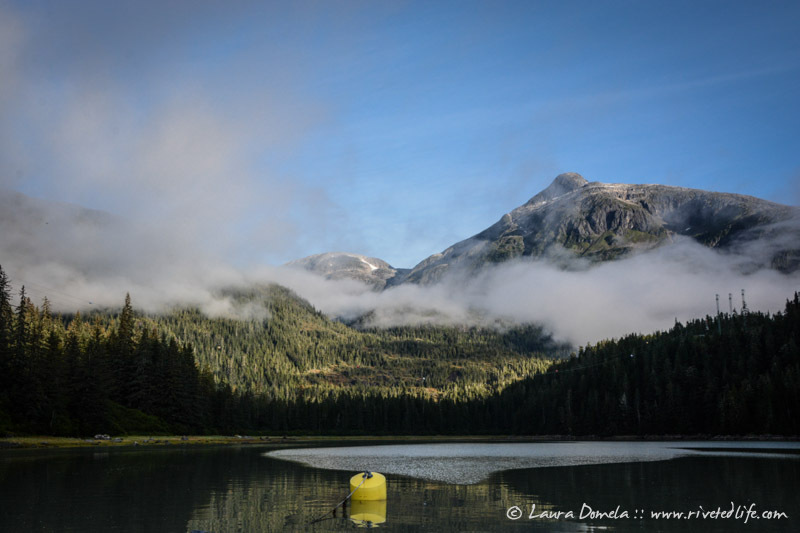 Nothing – not farming or pollution or politics or overfishing poses a bigger threat to the success of the hatchery, or to the sockeye population itself, than the virus. IHNV or Infectious Hematopoietic Necrosis Virus is a naturally occurring but lethal (to the fish) virus that infects a large percentage of the salmon population. 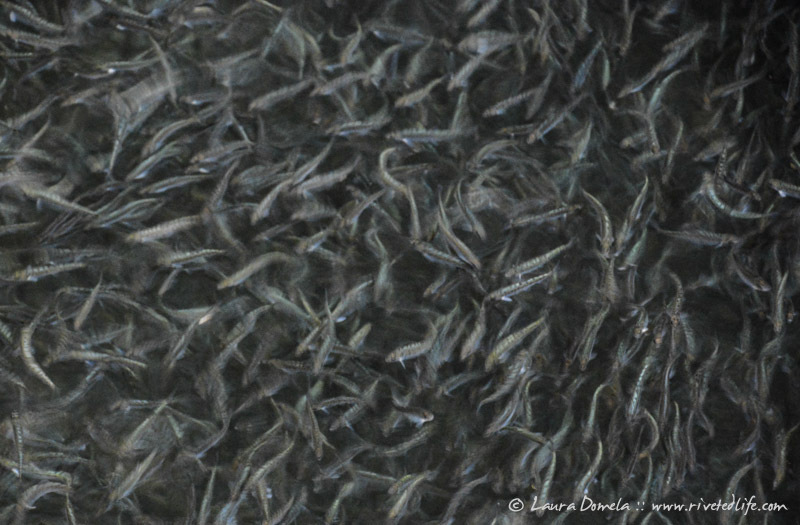 In the tight confines of a hatchery, it can rapidly spread – potentially causing the loss of the whole annual harvest. 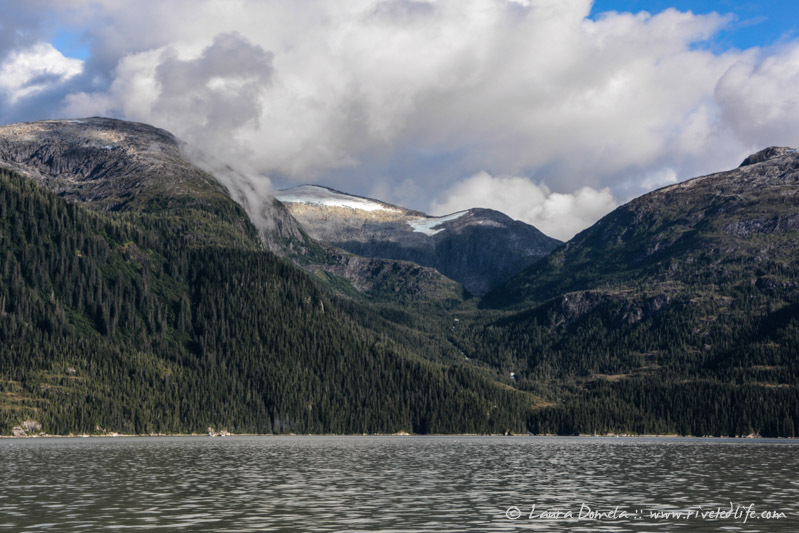 If you consider that there are only two Alaskan sockeye hatcheries (Snettisham and Main Bay Hatchery up in Prince William Sound), the loss of a single season’s harvest at one of those two hatcheries would be catastrophic. Some find themselves snagged in fishermen’s nets. Others are picked off by various predators. A persistent few make it all the way to the hatchery, where they swim and jump through a series of ladders and pens to a sorting area. Here, the hatchery staff selects the breeding stock for the next year. 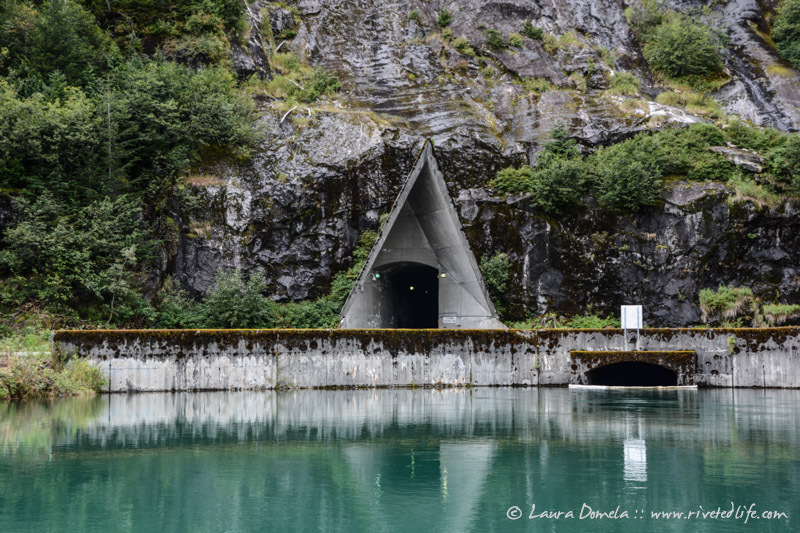 Males and females are culled into separate “raceways” where they will be held until it’s time to harvest eggs. The hatchery needs about 6,800 fish selected as breeding stock. These 6,800 fish will produce around nine million offspring which will be raised at the hatchery and released into the wild the following season. 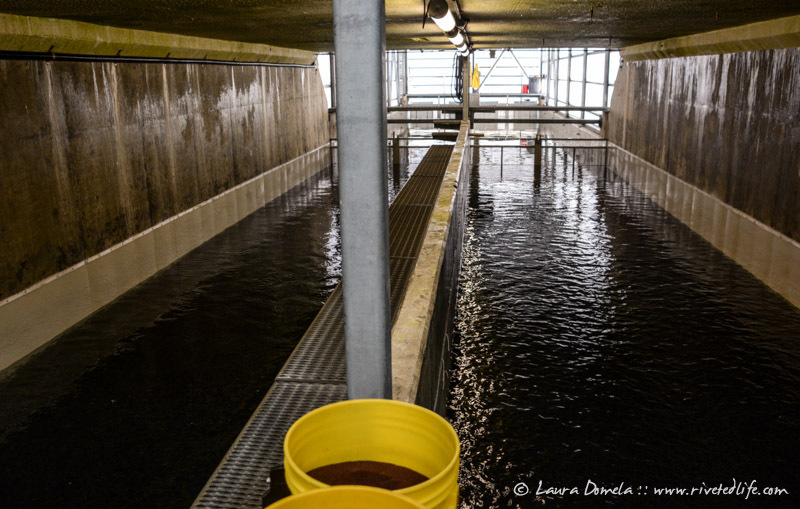 Additional fish that make it into the hatchery are harvested and transported to be sold. The money from selling these hatchery-harvested fish is the source of revenue for the operation of the hatchery. Since the hatchery is a non profit corporation, its goal is to harvest only enough fish to meet the operating expenses. This lets the hatchery avoid competing in the market with the commercial fishermen, and allows it to be more selective in the quality of fish it sends to market. The breeding stock that are selected this month (August) will be held in the raceways until October, when the egg harvest is done. Kevin and Darcy lead us into “the shack” which is the room where the eggs are harvested, fertilized, and disinfected before being moved into incubators. Egg harvest is a grueling one-month task for the staff. An assembly line is set up in the shack. In the first station (the “kill” station) females are killed and their eggs are removed and placed into individual bowls. Males are killed and their milt or gametes harvested. Bowls of eggs from three females are fertilized with milt from two males (breeding stock are retained in a ratio of 3:2 females to males). The milt is placed into the bowls on top of the eggs, then the process is activated by the addition of seawater. The fertilized eggs are carefully monitored and rotated through three separate disinfecting iodine baths. Any bowls showing the slightest signs of trouble are immediately discarded and destroyed. Great care is taken not to cross-contaminate between bowls. Since the virus is passed down from the female to the eggs, it is important to maintain separation of the batches from each female. If one batch falls victim, the rest are protected. Temperature and water quality are critical throughout this process. Finally, the fertilized eggs are moved into incubators (still separated as much as possible to protect against cross-contamination from viral outbreaks). Each incubator has three water sources available: cold, hot, and natural. 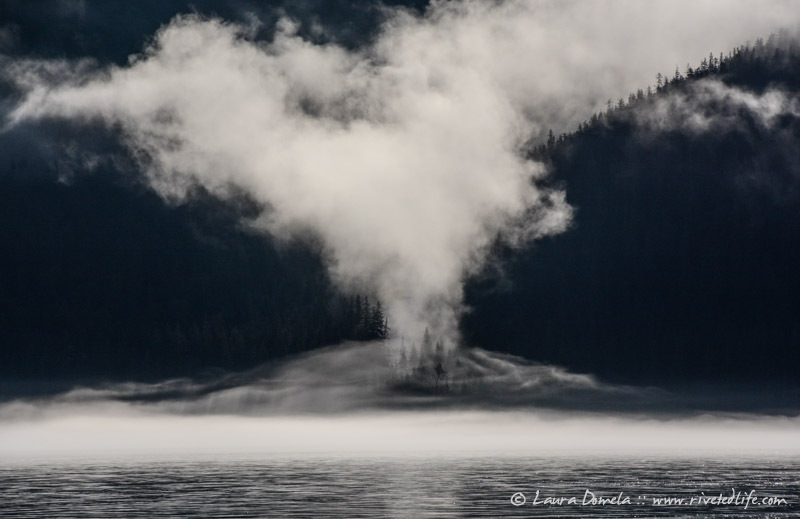 The cold and hot are carefully mixed with the natural to maintain the desired temperature for the incubating eggs. During incubation, the fish are marked with a special code using a fascinating technique called “Thermal Marking”. Fish have an organ called the otolith which is a part of their sensory system. 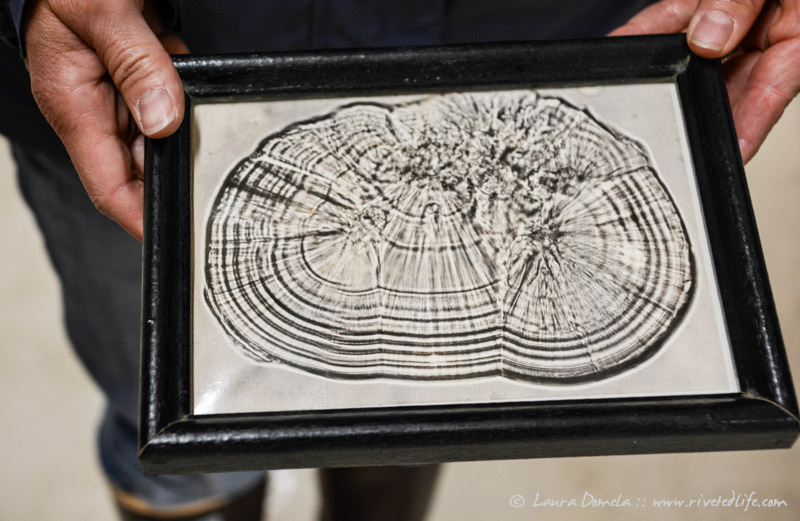 This organ has bands or “rings” (much like the rings in a tree trunk) that develop while the eggs are being incubated. Slight variations in water temperature cause these rings to be either light or dark. So, by subtly manipulating the temperature of the water, the hatchery can cause dark rings to be either wide or narrow, depending on the amount of time the temperature is held higher. These wide and narrow bands can be read like a bar code throughout the fish’s life. So each hatchery is able to mark a binary code on every fish that uniquely identifies its origin – without implanting any kind of chip or other tracking device. There is a worldwide database of codes, so it is theoretically possible to identify just about any hatchery fish by examining its bands. Approximately four months later, the eggs hatch and by early May the fry are ready to leave the incubator and feed. The fry have to be fed by hand, by trained observers who can monitor how much the fish eat and can distribute the food so that all the fry have an equal chance at being fed. Initially, the baby fish must be fed (again, by hand – automatic feeders apparently can’t do the job correctly) sixteen times per day. Over the next 14 months, the fry are monitored and moved into ever-larger environments. It turns out that the baby fish actually like to be crowded. They feed and flourish better when they’re fairly tightly packed than when they are given more individual space. With each move, the groups of fish are kept segregated to avoid passing the virus. If a tank shows signs of the virus, the entire tank is immediately destroyed. The staff working with the fish perform rituals right out of “The Andromeda Strain” – disinfecting themselves constantly, changing garb, walking through disinfectant foot baths at every entrance and exit. 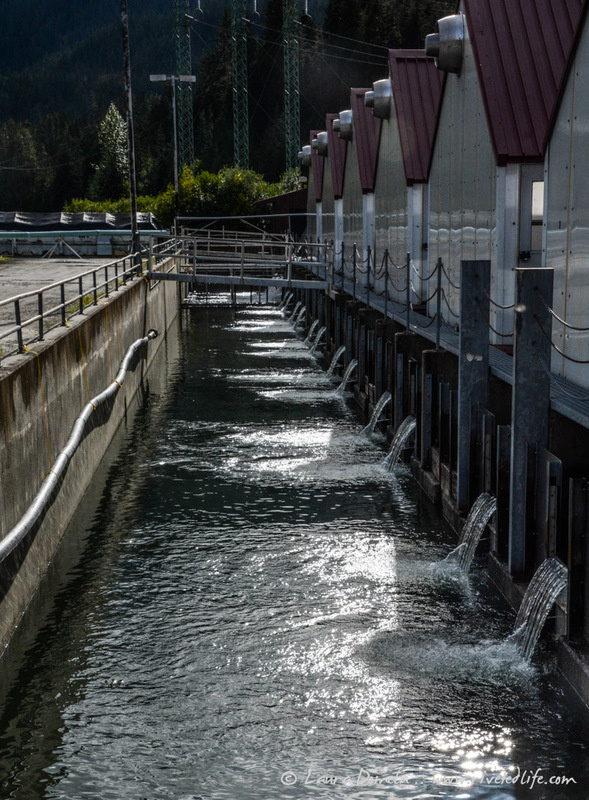 Similarly, the water flow through the facility is kept separate as it is used and discharged – making sure that the water that flows through one tank never finds its way into others. 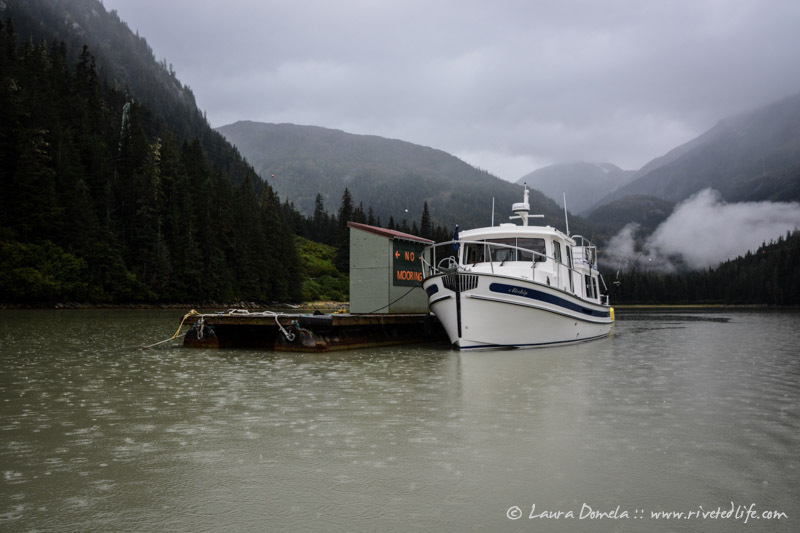 Finally, almost two seasons after they were hatched, the juvenile salmon are loaded up and transported to various locations where they are released into the wild. 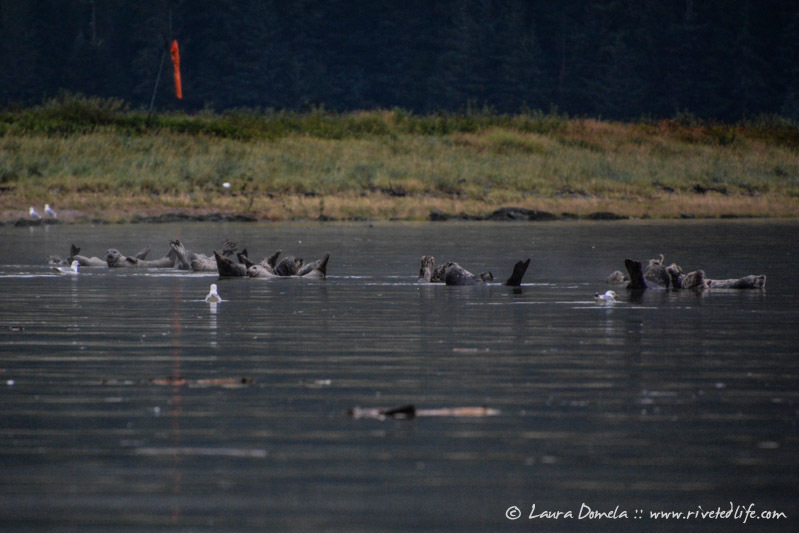 The ultimate goal is to achieve a 10% return rate, where about one million of the juveniles release would return three or four years later as adults to spawn again. 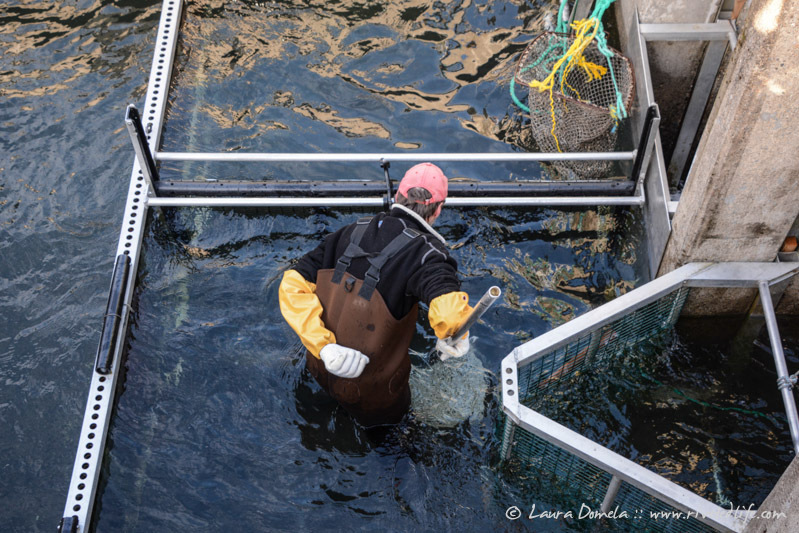 The juveniles are released in multiple locations to prevent a single natural problem from taking out the whole batch, and in order to study the methods and locations that result in the best return rates. At this point, the 10% return rate is a distant goal, and the hatchery struggles to achieve even a fraction of that. 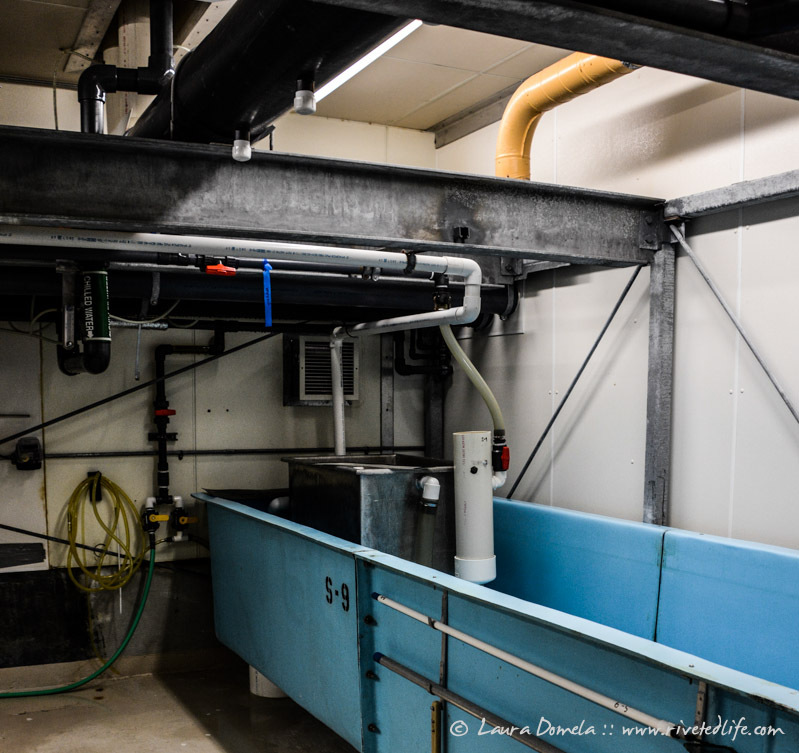 Other hatcheries have it much easier – with species that are less fussy and locations that are much easier for returning salmon to reach. Still, it’s this extreme challenge that makes life at Snettisham exciting. Kevin and Darcy took us back out to Airship and we invited them to come back for dinner on the boat later that evening. (We did not cook salmon…we figured they get enough of that.) I cooked and cleaned the two Dungeness crabs we caught at Taku that morning and we made some penne pasta with a creamy parmesan sauce with crab, and an arugula salad. It was a really fun evening! 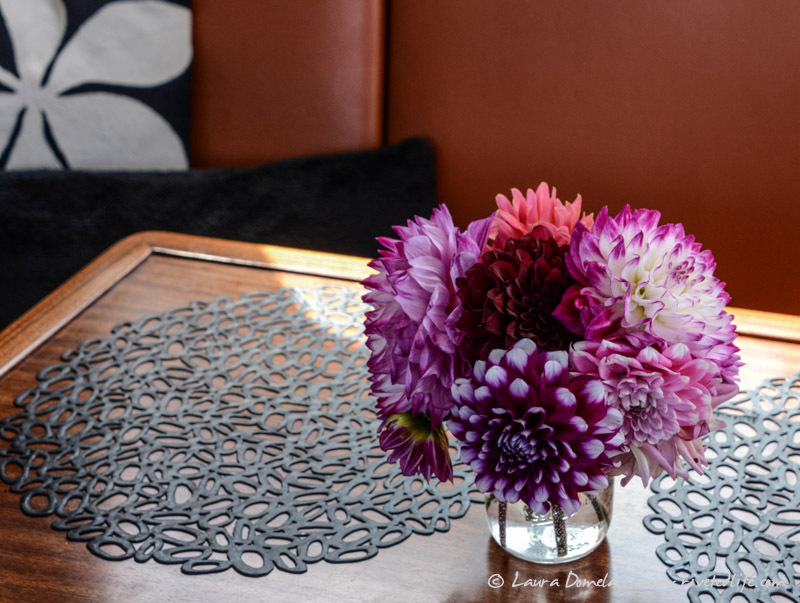 Kevin and Darcy brought us some gorgeous flowers from their garden, along with some fresh greens (kale, rainbow chard) and a just-pulled bulb of garlic. Touring Snettisham Hatchery and meeting the dedicated people who choose to spend their lives in this remote, beautiful, and challenging environment was a remarkable experience for us. Few people will ever have the opportunity to come here and see the tireless work these people invest every day in this gorgeous place. 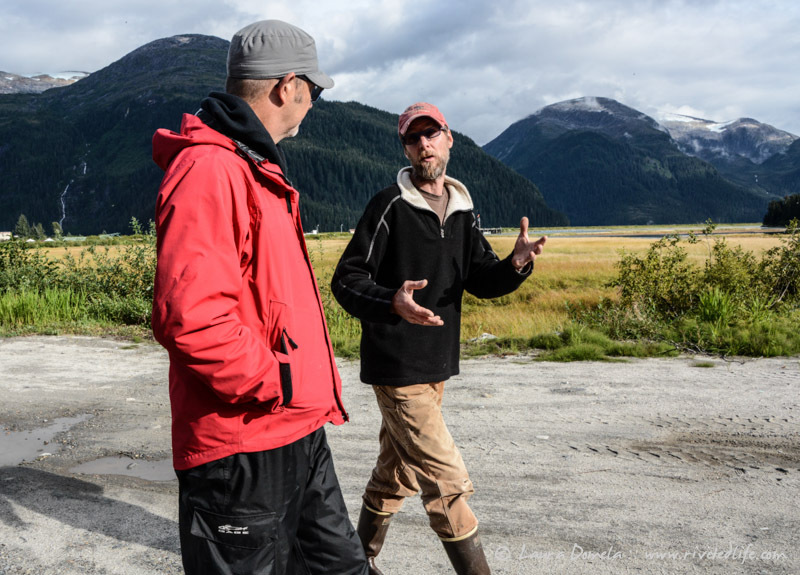 But, if you see “Alaskan Sockeye” on the menu or in the market, there’s a good chance that it started life here in Snettisham, lovingly aided by Kevin and Darcy and their crew. Don’t eat or buy “farmed” or “Atlantic” salmon. It’s bad for you. It’s bad for the environment. 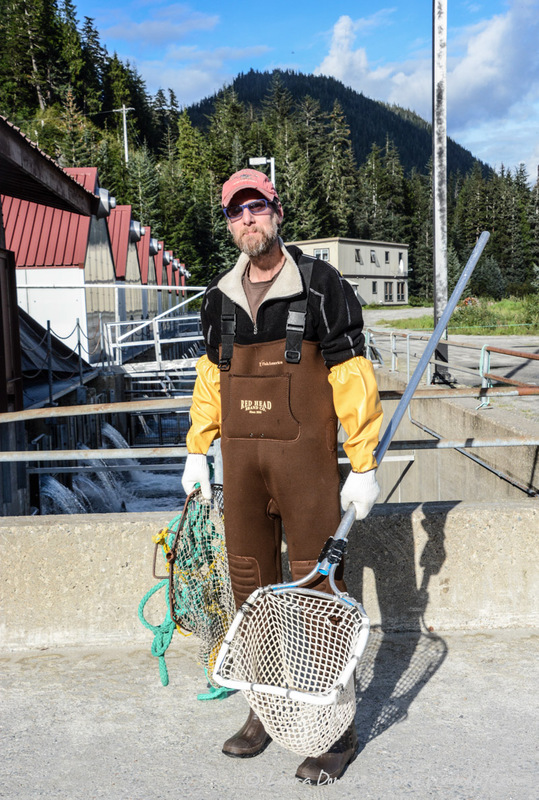 It’s bad for the economy, and it undermines the hard work that these people are doing every day to preserve and nurture this amazing natural resource and the Alaskan fishing industry. Thanks again, Kevin and Darcy! Next Post No More Boatyards. Humpbacks.